The Domaine de la Tortinière is a spectacular 19th Century Château, set within 15 hectares of picturesque parkland. The third generation owners will welcome you at their estate, where charm and elegance are combined for a luxurious stay. The Château is a majestic castle, nestled in Veigné, in the heart of the Loire Valley. With stunning grounds to explore, and the Indre River flowing through the park, it is a peaceful base for those visiting the famous Loire Valley wineries. Tours train station is just 20 minutes away and complimentary parking is provided on-site. 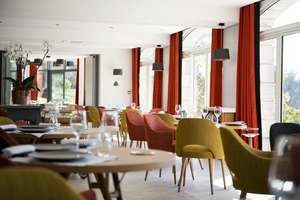 Domaine de la Tortinière combines the splendour of an authentic Château, with the modern facilities of a 4* hotel. During your stay, you will enjoy an array of leisure facilities including a heated outdoor swimming pool, tennis courts, pool table and table tennis. For those looking to relax and embrace the serene atmosphere, massage services are available upon request. 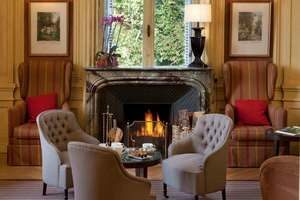 In the evenings, the cosy bar with its roaring fire offers the perfect spot to unwind, and the hotel’s Orangery is a beautiful spot for your evening meal, serving up sumptuous cuisine whilst overlooking the Indre Valley. 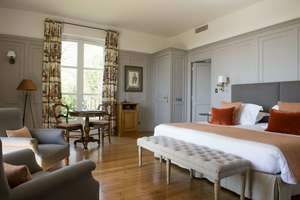 The Château has 24 rooms, either Charme or Prestige, and six Suites. Charme rooms offer a Queen or King-sized bed, and perfectly blend modernity and classic French style, with traditional antique furniture, contemporary decoration and facilities including air conditioning, mini-bar, safety deposit box, flat-screen television, bathroom with bath or shower, hairdryer, complimentary toiletries and WIFI. 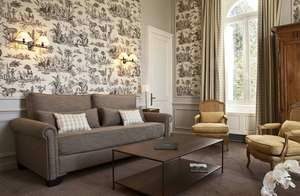 For those looking for a little more space, the Prestige rooms with a Super King or Twin beds can be found either in the Château or in the former garden chalet and offer views of the gardens and the spectacular Indre Valley. If you would like the real castle experience, treat yourself to a luxurious Château Suite, in the turrets of the castle! These spacious rooms have an adjoining lounge with magnificent views of the valley, and are equipped with Queen or Kind-sized beds. There are also Chalet Suites available, which are expansive and have a private terrace.